4.9 (Based on 21 Reviews) 100% of reviewers recommended this product. I PURCHASED AGENA'S 2" OUTSTANDING COMA CORRECTOR PRIMARILY FOR VISUAL VIEWING. I HAVE NOT GOTTEN BACK INTO ASTROPHOTOGRAPHY BUT ACCORDING TO DIRECTIONS AND ACTUAL FITTING OF THIS RING TO THE COMA CORRECTOR, WITH A 'T' RING IT SHOULD BE A PERFECT FIT FOR YOUR CAMERA TO THE CC. BECAUSE I HAVE YET TO USE THE RING I CAN ONLY SAY THAT IT GETS 5 STARS BASED ON THE EXCELLENCE OF THE GSO COMA CORRECTOR THAT IT CAME WITH! This adapter is well made and threads very smoothly. Recommended! This spacer was just as expected. No trouble with the threads (internal or external). Would highly recommend. Spacer works great. Great price to match. Good fit on the threads and the machining was very good. Nice spacer. Clean Threads. Nice and black. Used to place the two coma corrector at the right spot in the focuser on a Z10. From what my eyes can tell, seem like this is just the right length for 1.5" eyepieces ( the 2-1.5" adapter adds 10mm) and for 2" you need to use a parafoculizing ring or another roughly 10mm spacer. High quality and works perfect. Exactly what I needed and what was advertised. Agena takes care of you. It's a well made spacer ring, and worked well! The title sums it up. I have purchased several of the Blue Fireball products from Agena, and they are always of uniformly good quality. And Agena's service is always second to none. Fast shipping. Never disappointed. Review by Gomezdb of Calgary, Canada. Review by ABCxyz of Cle Elum, WA. This spacer is perfect for setting my GSO Comma Corrector in the proper position in the focuser for my two F5 Newtonians. Review by Big Ugly Guy of Tucson. You got this far because you need a spacer this long. It threads easily and securely. Like most threaded adapters, a little bit of wax burnished into the threads will minimize galling. Review by JJ of South Dakota. Review by Jose of Queretaro, Mexico. Blue Fireball products are always a secure purchase. Review by Ger of Canada. Review by cv of Reading, MA. Spacer of great construction. Threads easily. Review by Geyserland Observatory of Rotorua New Zealand. 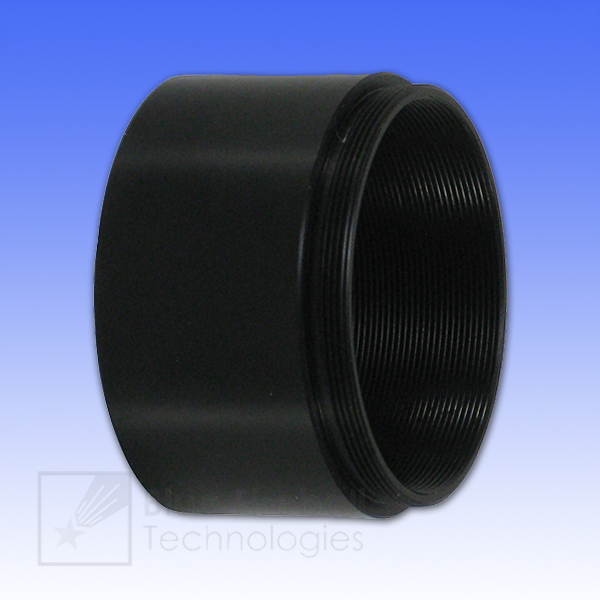 I use this spacer to get the right distance in my optical system an the telescope, it is fitting perfect and the stars are now nice round and clear on my images for my research. I screw this adapter into my 2" to 1-1/4" eyepiece adapter to get more distance from the 2" filter that screws into the spacer ring when inserting eyepieces. In my case some of my eyepieces were coming close or even touching the filter glass without the spacer ring. This adapter takes care of that problem. Review by Mara Costa of Guarulhos, Brazil. We always see 14mm, 28mm FTR Rings and Baader Filter to change focal lenght at Hyperion Eyepieces. The height is the same as Baader Filter and can be used like one. It don't creates glow inside eyepiece and are strong enough like a original FTR.